By Bernard F. Laya, D.O. and Betsy Grace G. Cheng, M.D. 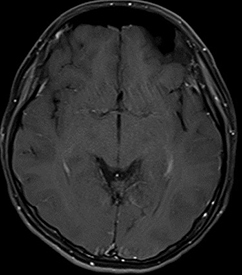 An 11-year-old boy presented with hypertension, seizure, and acute onset of blurred vision. An MRI was performed, showing bilateral asymmetric FLAIR hyperintensity in the cortical and subcortical regions of the occipital and parietal lobes (A and B). No abnormal enhancement was noted following gadolinium administration (C). 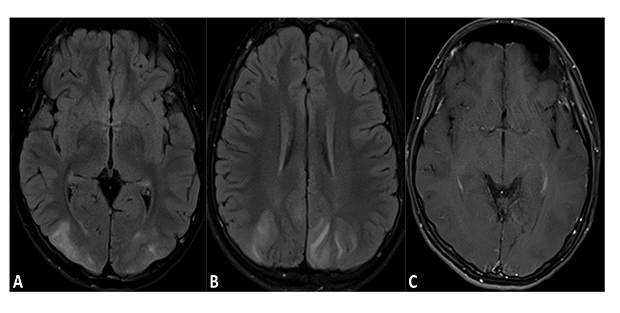 Posterior reversible encephalopathy syndrome (PRES) is a complex disorder that occurs in patients with a variety of complex systemic and metabolic conditions. The pathogenesis remains unclear but is believed to be a result of autoregulation dysfunction and vascular injury. It may occur at any age from 4 to 90 years, many of whom have co-morbidities such as hypertension, impaired renal function, and autoimmune disease. The most common presenting symptoms are seizures, mental status change, visual abnormalities, headache, nausea or vomiting, aphasia, and even shock. 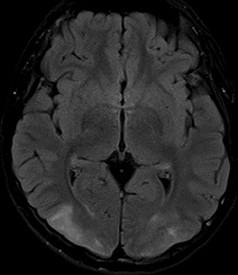 MRI depicts the characteristic T2 and FLAIR high signal edema, typically bilateral, involving the cortical and subcortical white matter regions of the parietal and occipital lobes. Frontal and temporal lobe involvement may also be seen. Basic imaging pattern follows the watershed zones with three pattern variants depicting the lateral, medial, and posterior blood supply. The cerebellum, basal ganglia, and brainstem are less commonly affected. Complications include ischemia from conversion to cytotoxic edema and hemorrhage from oxidative stress and reperfusion injury. Management is aimed at identifying and ameliorating the underlying cause. The prognosis in majority of patients is favorable as most cases completely resolve; however, some develop frank ischemia with progression to infarction and occasionally death. 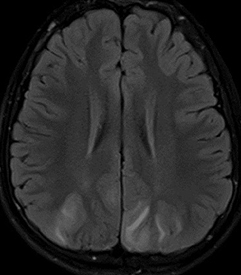 At the Viewbox: Posterior Reversible Encephalopathy Syndrome (PRES). J Am Osteopath Coll Radiol. Bernard F. Laya, D.O. and Betsy Grace G. Cheng, M.D. Dr. Laya and Dr. Cheng are with the Institute of Radiology, St. Luke’s Medical Center, Quezon City and Global City, Philippines.